It’s Friday, which means two things: You’re killing it with your casual attire and it’s time for another one of Anthony Richardson’s CPU vs. CPU NBA Playoffs Playthroughs. 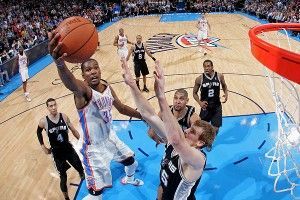 This week, Anthony tackles the huge Western Conference Finals clash between San Antonio and OK Computer Oklahoma City. And as usual with these things, everything is going to explode. Scott Brooks is compared to Michael Douglas, Manu Ginobili wins a DVD of Ghosts of Girlfriends Past, and I actually think Anthony might be on to something by shouting, “HARD-ENNNNN” every time James Harden chucks up a 3. Enjoy the video, and for the love of all that is holy, please follow Anthony Richardson and CPUvsCPU on Twitter. And while you’re at it, enrich your life further by subscribing to all of the playthroughs on YouTube. You will be a better person for it.